While we’re all watching Spain and Greece, their alleged saviors in the rich core of the eurozone are starting to show serious signs of corrosion. This makes all the hollow words and promises coming from the world of troikas and politics sound even emptier than they already did. Not that anyone in Holland or Germany seems to even be prepared to think their economies are in for a big fall; for them, all the bad stuff is temporary, and soon it will all be better. Our proverbial Martian might be tempted to think denial is a river in northern EuropeTo wit: after a slew of reports on the housing situation in Holland earlier this year, by the Dutch government’s Central Statistics Bureau, the Dutch Central Bank and the Central Plan Bureau (CPB) – got to love the name -, the real estate sector itself issued a paper today, which, despite the obvious bias, makes everything look worse. Again. As I wrote in Those Dutch Tulips Ain’t Looking All That Rosy last month, home prices in Holland rose some 20% annually around the turn of the century/millennium, for a total of 228% from 1985-2007. House prices fell 8% from a year earlier, statistics bureau CBS said Tuesday, the largest decline in the 17-year history of the agency’s house-price index. Prices fell 4.4% in June and 5.5% in May. [..] House prices have fallen about 15% since their peak in August 2008 amid a stagnant economy, more stringent bank-lending criteria and weak consumer sentiment. Today, the NVM (Dutch Real Estate Brokers Association) announced that among its members (good for 86% of transactions), Q3 sales were down 17.2% (!) from Q2. Home prices fell 2.2% from that quarter, and 7.5% from Q3 2011. Average home prices are now down 21% compared with 2008, from €265,000 to €209,000. 700,000, or over 20%, of Dutch homeowners are now underwater. The NVM expects 100,000 homes to be sold in 2012, and labels this the “absolute bottom”. The market has rejected the euro and the EU. Now Draghi proposes to reject the market. In a groundbreaking reversal, he has indicated he will print currency to buy eurozone sovereign debt. 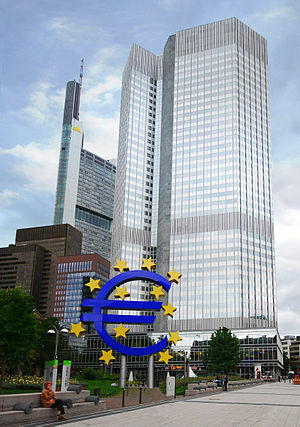 Mario Draghi, president of the European Central Bank (ECB), will do “whatever is necessary” to ensure a solvent euro. Draghi made the comments at an investor conference at the Olympics. Professional investors like John Fox, director of research at Fenimore Asset Management, believe it may mark a turning point in the four-year old crisis. Of course, there may be another reason why Draghi is doing this now but it is nothing that Fox would ever allude to. We’ll get to it toward the end of this article. In any case, one wonders how much of Draghi’s statement is merely an attempt to “talk up” the market and how much is grounded in reality. To be sure, he is obviously trying to sound tougher about using an array of monetary weapons at his disposal. After a brief rally ( poss up to 1.26 .I expect to see the Euro hit new lows perhaps down to 1.10 even lower if Spain and Italy has to get a bailout! The European Central Bank refused to comment today on reports that it had recommended senior bondholders should take losses in the event of a restructuring of Spanish bank debt. But two officials with knowledge of the ECB’s thinking said it would no longer oppose the forcing of losses on senior bondholders of euro-area banks. A key condition to imposing losses is if the bank in question is being wound down, one of the officials said. Both of them spoke on condition of anonymity as the talks are confidential. A report in the Wall Street Journal today said ECB president Mario Draghi advocated imposing losses on senior bondholders issued by “the most severely damaged” Spanish savings banks at a meeting of European Union finance ministers on July 9th. Is Ireland in line for €100bn refund after ECB changes stance on bondholders? In the immortal words of Ray Burke commenting on a chance of a receipt for an alleged bung, “is it f*ck” but as fantastical as it may seem, it might be the logical conclusion of taking account of the sums paid to senior bondholders in the bailed-out banks together with the comments ascribed to ECB president Mario Draghi in the Wall Street Journal yesterday. In April 2012, Minister for Finance Michael Noonan in response to a question from the Fianna Fail finance spokesperson Michael McGrath confirmed that between 30th September 2008 when the bank guarantee was introduced and April 2012, a total of €103.7bn has been paid to senior bondholders in the state-guaranteed banks, comprising €33.1bn to “secured” bondholders and €70.6bn to “unsecured” bondholders. And analysed by bank – €32.5bn was paid by AIB/EBS, €35.7bn was paid by Bank of Ireland, €10bn was paid by Irish Life and Permanent and €25.5bn was paid by IBRC. To date, the State has injected €64.1bn into these four banks and in addition, NAMA has paid €5.6bn in state aid for the acquisition of loans, which represents a premium over what the loans were worth on the open market. Can The World Survive Washington’s Hubris? June 29, 2012 “Information Clearing House” — When President Reagan nominated me as Assistant Secretary of the Treasury for Economic Policy, he told me that we had to restore the US economy, to rescue it from stagflation, in order to bring the full weight of a powerful economy to bear on the Soviet leadership, in order to convince them to negotiate the end of the cold war. Reagan said that there was no reason to live any longer under the threat of nuclear war. The Reagan administration achieved both goals, only to see these accomplishments discarded by successor administrations. It was Reagan’s own vice president and successor, George Herbert Walker Bush, who first violated the Reagan-Gorbachev understandings by incorporating former constituent parts of the Soviet Empire into NATO and taking Western military bases to the Russian frontier. The process of surrounding Russia with military bases continued unabated through successor US administrations with various “color revolutions” financed by the US National Endowment for Democracy, regarded by many as a front for the CIA. Washington even attempted to install a Washington-controlled government in Ukraine and did succeed in this effort in former Soviet Georgia, the birthplace of Joseph Stalin. The President of Georgia, a country located between the Black Sea and the Caspian Sea, is a Washington puppet. Recently, he announced that former Soviet Georgia is on schedule to become a NATO member in 2014. Those old enough to remember know that NATO, the North Atlantic Treaty Organization, was an alliance between Western Europe and the US against the threat of the Red Army overrunning Western Europe. The North Atlantic is a long, long ways from the Black and Caspian Seas. What is the purpose of Georgia being a NATO member except to give Washington a military base on the Russian underbelly? The evidence is simply overwhelming that Washington–both parties–have Russia and China targeted. Whether the purpose is to destroy both countries or merely to render them unable to oppose Washington’s world hegemony is unclear at this time. Regardless of the purpose, nuclear war is the likely outcome. The presstitute American press pretends that an evil Syrian government is murdering innocent citizens who only want democracy and that if the UN won’t intervene militarily, the US must in order to save human rights. Russia and China are vilified by US functionaries for opposing any pretext for a NATO invasion of Syria. The facts, of course, are different from those presented by the presstitute American media and members of the US government. The Syrian “rebels” are well armed with military weapons. The “rebels” are battling the Syrian army. The rebels massacre civilians and report to their media whores in the West that the deed was done by the Syrian government, and the Western presstitutes spread the propaganda. Someone is arming the “rebels” as obviously the weapons can’t be purchased in local Syrian markets. Most intelligent people believe the weapons are coming from the US or from US surrogates. So, Washington has started a civil war in Syria, as it did in Libya, but this time the gullible Russians and Chinese have caught on and have refused to permit a UN resolution like the one the West exploited against Gaddafi. To get around this roadblock, fish out an ancient Phantom fighter jet from the 1960s Vietnam war era and have Turkey fly it into Syria. The Syrians will shoot it down, and then Turkey can appeal to its NATO allies to come to its aid against Syria. Denied the UN option, Washington can invoke its obligation under the NATO treaty, and go to war in defense of a NATO member against a demonized Syria. The neoconservative lie behind Washington’s wars of hegemony is that the US is bringing democracy to the invaded and bombed countries. To paraphrase Mao, “democracy comes out of the barrel of a gun.” However, the Arab Spring has come up short on democracy, as have Iraq and Afghanistan, two countries “liberated” by US democratic invasions. What the US is bringing is civil wars and the breakup of countries, as President Bill Clinton’s regime achieved in former Yugoslavia. The more countries can be torn into pieces and dissolved into rival factions, the more powerful is Washington. Russia’s Putin understands that Russia itself is threatened not only by Washington’s funding of the “Russian opposition,” but also by the strife among Muslims unleashed by Washington’s wars against secular Muslim states, such as Iraq and Syria. This discord spreads into Russia itself and presents Russia with problems such as Chechen terrorism. When a secular state is overthrown, the Islamist factions become free to be at one another’s throats. The internal strife renders the countries impotent. As I wrote previously, the West always prevails in the Middle East because the Islamist factions hate one another more than they hate their Western conquerers. Thus, when Washington destroys secular, non-Islamist governments as in Iraq and now targeted in Syria, the Islamists emerge and battle one another for supremacy. This suits Washington and Israel as these states cease to be coherent opponents. Russia is vulnerable, because Putin is demonized by Washington and the US media and because Putin’s Russian opposition is financed by Washington and serves US, not Russian, interests. The turmoil that Washington is unleashing in Muslim states leaks back to Russia’s Muslim populations. It has proved to be more difficult for Washington to interfere in China’s internal affairs, although discord has been sowed in some provinces. Several years from now, the Chinese economy is expected to exceed in size the US economy, with an Asian power displacing a Western one as the world’s most powerful economy. Washington is deeply disturbed by this prospect. In the thrall and under the control of Wall Street and other special interest business groups, Washington is unable to rescue the US economy from its decline. The short-run gambling profits of Wall Street, the war profits of the military/security complex, and the profits from offshoring the production of goods and services for US markets have far more representation in Washington than the wellbeing of US citizens. As the US economy sinks, the Chinese economy rises. The US Navy is reallocating fleets to the Pacific Ocean and constructing a new naval base on a South Korean island. US Marines are now based in Australia and are being reallocated from Japan to other Asian countries. The Chinese are not stupid. They understand that Washington is attempting to corral China. For a country incapable of occupying Iraq after 8 years and incapable of occupying Afghanistan after 11 years, to simultaneously take on two nuclear powers is an act of insanity. The hubris in Washington, fed daily by the crazed neocons, despite extraordinary failure in Iraq and Afghanistan, has now targeted formidable powers–Russia and China. The world has never in its entire history witnessed such idiocy. The psychopaths, sociopaths, and morons who prevail in Washington are leading the world to destruction. If Yemen Falls, so Does the Dollar Reserve? How can one silly, little and desperately poor country full of people in ankle-length white robes be in the position to take down the Anglo-American empire? First, context. It hasn’t been a good year for the West’s power elite. Yemen is only one country in tumult. Other countries verging on civil war are Bahrain and Syria. (Libya is already convulsed.) But in fact there are hundreds of places in the Middle East, Africa and Europe now where people are demonstrating and marching – or fighting with various levels of efficiency and organization. In Afghanistan, the Obama administration is said to be desperately searching for Mullah Omar, the one-eyed leader of the Taliban, now and again reported dead or missing. US officials, in turn, wish to find Omar so that they can work out a deal where the US declares victory and Omar retains the territory. Some victory. Libya is currently in a stalemate; China is Pakistan’s new best friend; Pakistan’s generals are again denying what Ms. Hillary Clinton – US Secretary of State – said only a week ago, that the Pakistan army was about to launch a significant attack against the Pashtun/Taliban. It’s not true, the generals say. Meanwhile, Egypt’s youths sleep on the streets; Tunisian youth are no happier; Iran is gaining considerable regional influence because of the “color revolutions” that the CIA apparently triggered. Even the Palestinians are resurgent. America’s CIA-sponsored AYM youth movements were behind the initial color revolutions. But notice how the mainstream press has stopped celebrating them. Perhaps they haven’t worked out as planned. In fact, things don’t look pretty for the West. Either Western elites are encouraging a series of Arab Islamic Republics (so as to buttress what seems to be an essentially phony “war on terror“) or they are trying to create controllable regulatory democracies that will likely be run by dependable militaries with a constitutional façade. Neither of these options looks to be feasible in the near term. Alternatively, the West seeks generalized chaos for some reason – or, more intriguingly, it has simply lost control of the situation. As we’ve stated before, Yemen is important because it may well indicate how much control the West actually has over the Arab Awakening. So far, what’s been most apparent is dithering. The West hasn’t shown a firm hand. There are reasons why. That means that individuals nominally allied with Saleh tried to knock him off. And why not? He is a thoroughly despicable man. He has ruled Yemen for about 30 years through a mixture of truculence and torture; like Gaddaffi, his favorite method of staying in power is one of “divide and conquer” in which he set various tribes against each other. Yup … Yemen is another “tribal backwater” like Afghanistan – a place where the Anglo-American elite (exaggeratedly) has no interest. It is like a kid kicking a stone past the house of a pretty girl. He just happened along the way … and thus the US just “happened’ into Afghanistan and Iraq. In fact, the US is intensely interested – mesmerized in a kind of Ted Bundy (bad) way. How seriously does the Anglo-American empire take Afghanistan (as a speed-bump on the way to world government)? Try, probably, say … US$2 trillion in expenditures, thousands killed and tens of thousands wounded. True the total all-in cost hasn’t been as much as Vietnam (50,000 dead and 500,000 wounded) but there’s considerable evidence that the US has been undercounting the dead and wounded through a variety of manipulations. So now my beloved Yemen is on the verge of going up in flames, on the verge of a cataclysmic civil war. I say “my beloved” because I had such an extraordinary time there on an Intrepid Journey a few years back Not a lot of people actually know where Yemen is. I don’t think I really did until I checked a map before we went there. It is essentially the bottom left portion of the Arabian Peninsula. And what I certainly didn’t realise about the entire Arabian Peninsula is that a massive mountain range runs north to south down its western side, sloping down eventually to the Red Sea. In fact, the Saudis move their capital up to the mountains, to Taif, during the ferocious Arabian summers. The Yemeni capital Sana’a sits in this same mountain range. The thing about Yemen is the architecture. There is nothing like it in the world. They seem to have engineering in their genes. They built skyscrapers when no one was doing it. Osama Bin Laden’s father, who got rich building roads in Saudi Arabia, was Yemeni. He got so rich he rebuilt the mosque at Mecca with his own money. Old Man bin Laden came from one of the most spectacular parts of the world I have ever seen, the Wadi Hadromaut. It is probably as vast and as breathtaking as the Grand Canyon. And all through this great and ancient valley are villages perched on high, impossible sites, above steep cliffs, and you look at them and marvel because they have been there hundreds and hundreds of years. How in God’s name did they do that, you find yourself asking time and again, round every corner. It’s the same through the entire country, especially in that great mountain range, villages with slim, square buildings six or seven storeys on the most unreachable ridges and peaks. And, of course, that was the point. Defensively, they are brilliantly sited. The truth is, neither the Turks – of whom there are still some 10,000 in Yemen – nor the British ever really conquered anywhere but the Yemeni coast. You couldn’t get near those mountain villages. The Yemenis simply rolled great rocks down on you. As Afghanistan is the key to Middle Asia, so Yemen is the key to “Arabia.” The tribes of Oman and the Arab Emirates flowed out of Yemen. The Saud family came from Yemen apparently. And today Yemen is no less important than before in terms of the Great Game. It is perched on the edge of one of the most important waterways in the world and fronts the soft underbelly of Saudi Arabia – the part where many of the most profitable oil wells are located. Yemen is formidable, and strangely important. But because of the mountains, because of the tribes, because of the weaponry (three rifles for every Yemeni), because boys are expected to be proficient with weapons from an early age, Yemen has not been high on the list of the Anglosphere’s “civilizing” influences. What Western mainstream media isn’t bothering to report, however, is that the Anglo-American power elite could already have done away with Saleh if it wanted to. He’s their man and has been for all of his violent existence. It is reprehensible that that Western elites would rather let Yemen drift into civil war than cease to support Saleh. There have been no moves made in the UN to put pressure on Saleh, no sanctions – only apparently regular ammo and tear gas refills, which he has used to slaughter hundreds of Yemenis. The Western elites have not moved to do away with Saleh because they cannot apparently find a thug to put in his place that will garner a modicum of tribal support. The result of all this is growing antipathy. Possibly, because Yemen is another funny “impoverished backwater,” the US has handled the Yemen very badly. The whole country is inflamed. Saleh, now wounded, will likely never get his power back and the chances that the CIA will have the opportunity to create a new Saleh are growing slimmer by the minute. The corrupt and vicious Saudi regime lies at the heart of Money Power. Without Saudi willingness to support the continued dollar-oil exchange (forcing the rest of the world to hold dollars) the dollar reserve currency system fails. The Saudis were willing accomplices, but in reality they didn’t have a choice. The world’s economy, when you come down to it, is a product of American military force. Use the dollar to buy oil or else … But if the US and Saudi Arabia cannot control the spiraling disaster in Yemen, the next stop on the revolutionary train is Bahrain. And after that … Saudi Arabia. And THIS time, events will not be easily salvageable. The Internet has educated the Arab world about its history. If the Anglosphere elites had only used their tremendous industrial and monetary advantages to build a free-market instead of a phony one (disguised as a free one)! But the elites chose to propagate a central banking economy in order to chase after world government. Now they are in danger of losing the dollar reserve (GOOD! ), which will deal a terrible blow to Western central banking and perhaps end up with the creation of an entirely new (and uncontrollable) currency. Anyway, if Saudi Arabia falls, the dominoes may simply keep tumbling. Who pays any attention to funny little countries like Yemen anyway?